Limited release beers are big business - the lines and events surrounding Pliny the Younger, Dark Lord, Kate the Great, Black Tuesday, and Darkness can serve as proof. But one highly anticipated limited release that flies under the bigger craft beer community radar is Oaken Barrel's Apple Buzz - a beer + honey + cider creation that brings a thirsty audience to Greenwood's award winning brewery. Looking for proof of that demand? The Monday release saw 133 cases of the stuff move through Oaken Barrel's doors - selling out supply for the day and surprising even the brewers themselves. Luckily, a second batch was awaiting bottling, and was made available Tuesday at noon. It sold out Tuesday. All told, 60 barrels (at rough estimates around 1200 6 packs) of Apple Buzz we sold to the general public in two days. Proof of demand could be found everywhere in the restaurant, where folks of all shapes, sizes, and (legal) ages could be seen carrying whole cases out the door with them. 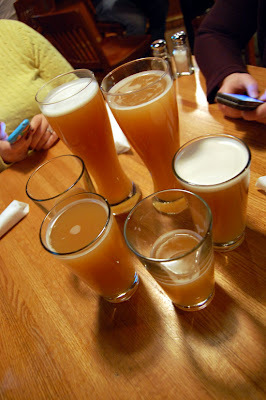 As further proof of our inability to cover everything (we're trying), our Monday evening roundtable at Oaken Barrel was our first exposure to Apple Buzz. It won't be our last, as we acquired a case of our own on Tuesday - which we'll be sharing at Tailgate for Nothing 3. The (can we call this a) beer(?) itself is a strange beast - cloudy beyond cloudy, with a nose that gives away no clues as to what's to come. The front is fizzy, followed by light, never cloying apple flavor and just a hint of honey. The beer finishes with a lively but not overwhelmingly fizzy flourish and begs for another sip. This isn't a cider - or at least it isn't one you've had before. I'd gladly drink more than two. 3.99 Mugs. When I heard about Apple Buzz last year and how quickly it sold out, I was incredibly skeptical. How could cider be so popular? So this year, Jess convinced me that we should go down on release day and try it. Much to our dismay, it turned out that this year's Apple Buzz was so popular, 6-packs sold out in roughly 7 hours. Luckily, Oaken Barrel bottled the rest of it and I was able to pick up some on Tuesday (TFN3!). 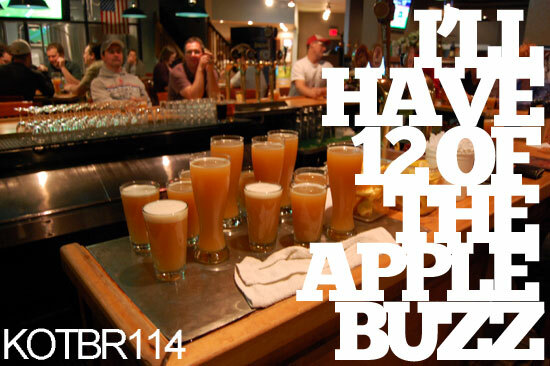 We were, however, able to drink Apple Buzz on tap. I must say, it is not at all what I expected. This beer is less apple cider and more honey apple lambic. 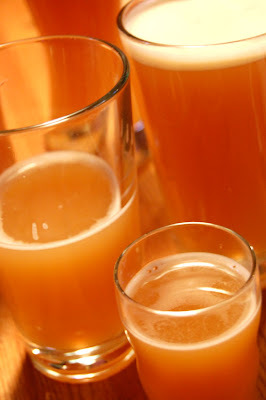 Granny Smith and cider apples fill up the yeasty body of this beer, along with cider-like notes of cinnamon and cloves. Honey provides an interesting twist on the sweetness, and an overall lemon-like tartness creates a relatively dry finish. If sour apple hefeweizen was a style for beer, this would be it. I think Oaken Barrel is on to something here. 3.5 mugs. This is the first year I have made it to try the Apple Buzz and I am glad I did. We were always too late for the releases in the last few years so I was happy to hear about the upped production this time around and that we'd be able to at least try it on tap. It is a fantastic mix of tart apple and fizzy, sweet honey. The nose was bright and funky and the only thing I could equate it to was how a field smells after a rainstorm. I am well aware that sounds wackadoo, but that is just what I kept thinking whenever I smelled it. It is very refreshing and scary drinkable for the higher alcohol content. 3.96 Mugs. Apple Buzz first gets to our table in a conglomerate of glasses and looks like unfiltered cider from the pumpkin patch. There's a yeasty, champagne funk in the nose with just a little fizz tickling your nose. It pours with a slight head and leads you to a nice yeasty apple flavor with a slight honey sweetness. This cider honey conglomeration is not sweet, very tangy and just a bit tart without being mouth puckering. It's not at all what you're expecting from a cider ale and leaves you refreshed and wanting more. 3.9 mugs.